We seem to have established a tradition now, as this is the second year of children bringing flowers to decorate our Easter Cross. Our House Captains proudly carried our school banner and our Easter Cross into the church. Friday 15th March ... and there are an awful lot of RED NOSES in school today!! 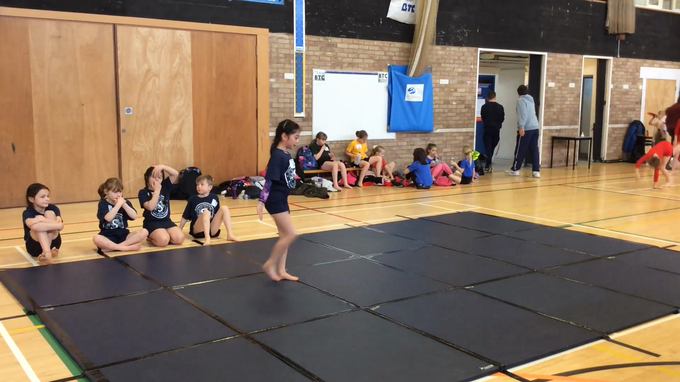 Congratulations to our amazing Year 3 & 4 gymnastics team of Kyra, Matilda, AlfieP, Jess, Ruby and Daisie who took part in the area competition. They came second and are now through to the County Competition! 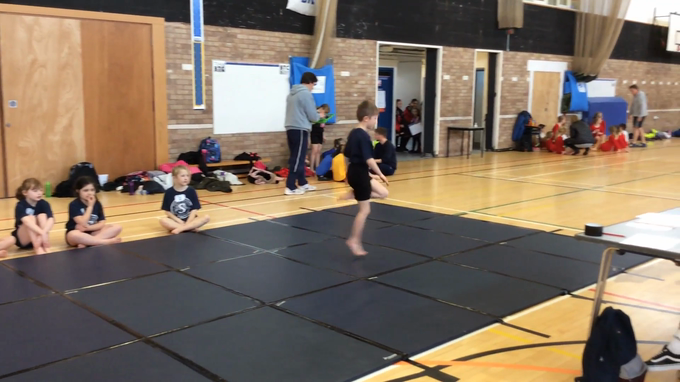 Our Years 5 ang 6 team also performed really well ... but we are still waiting to hear their overall results. Mrs Withers brought in three of her bantam chickens to help us think about how we might celebrate differences. We met the cockerel first... he had a beautiful, long tail and a red comb and wattle. Then we met the hen. She didn't have long tail feathers or a wattle and her feathers were brown. The third chicken had been born and started to grow up looking like a hen but then something amazing began to happen....... she started to grow long tail feathers, thick, brightly coloured feathers on her body and a red wattle. Some amazing things happen in nature! Our aim was to come dressed as our favourite book character and bring with us the book to share. There were so many different characters and stories represented and we had great fun parading on the catwalk to some well chosen music! David Walliams' books proved to be very popular! This morning we were joined by members of the congregation from St John's Church for our first ever 'Open the Book' session. They presented the story of Samuel being called by God and helped us understand the meaning through drama. The children really enjoyed the worship and are looking forward to welcoming the group back at the end of March. 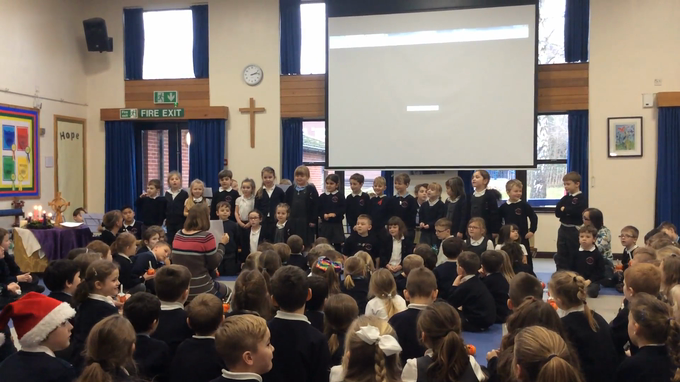 Oak Class led their worship for parents and children yesterday when they shared many of the things they had been learning about this half term. 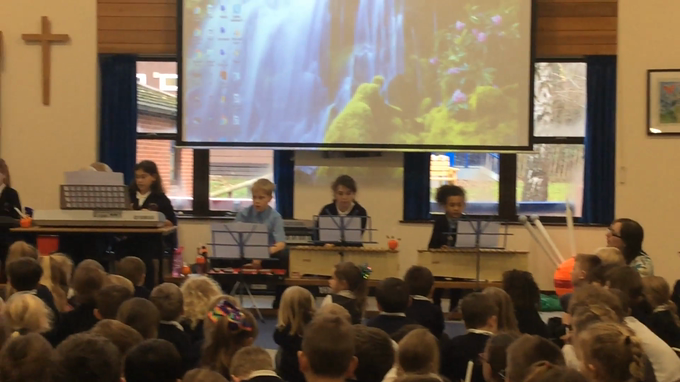 A real highlight was their whole class clarinet performance! As part of our Community Week project, Cherry Class worked with our church community at St. John's. They were asked to lead yesterday's Candlemas Service. The children decided to decorate the church with candles and made candle holders inspired by patterns in the church. They also helped organise the service including choosing hymns, preparing an order of service and writing prayers. On the day, the children welcomed the congregation, performed a dramatised reading of the story of Anna and Simeon meeting Baby Jesus, and led the prayers. The congregation have asked if they can lead the service every week! Children from Beech Class made new friends when they visited The Firs Nursing Home this morning to read stories to the residents. Each child also took a card that they had made with them to give to their reading friend. It was a happy time for everyone and such a success that the children have been asked to make this a regular event. 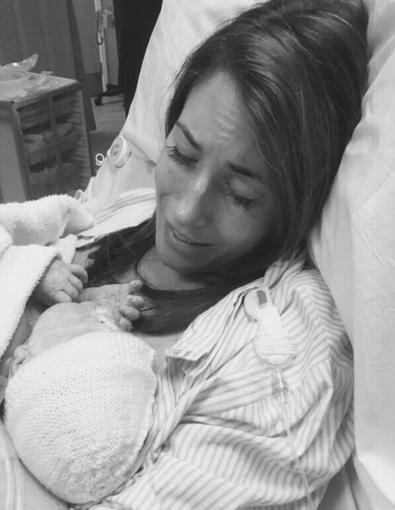 Congratulations on the safe arrival of Lily & Logan !!!! Congratulations to Mr and Mrs Harding on the birth of their twins, Lily and Logan, today at about 11:45. Lily weighed in first at 5lbs 10oz and then Logan at 5lbs 14ozs. As part of their learning in RE rowan class held a wedding service today. Everyone dressed in the very best clothes to celebrate the marriage .... and the bride and bridesmaids looked particularly beautiful ! It has been with great excitement and anticipation that we have looked forward to the installation of our stained glass window. Every child in the school was invited to submit a design and after much deliberation the one we chose was designed by Ellie. Money for the window was raised by the children through book and cake sales and we were also very grateful for the fundraising on our behalf by members of the St John's Church congregation, particularly through a well supported coffee morning. The beautiful window is set at the very heart of the school and with the words 'Grow and Shine in God's love' it reflects the ethos and spirit of our school. This morning Rev Kivett, members of the St John's congregation and Ellie's parents joined us for a special service of blessing. Ellie confidently talked to us all about how she had come up with her design and we sang one of our favourite hymns, Shine Jesus Shine', which seemed to fit in with the message of the window really well. Bless and hallow this window. That they may reflect the light of Christ in their lives. 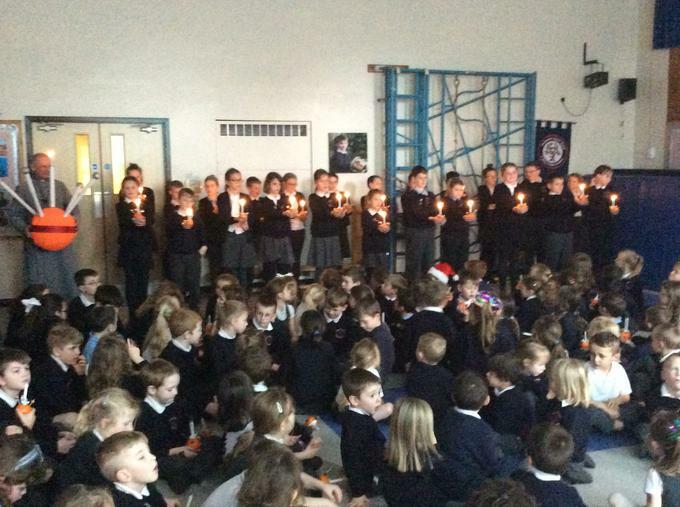 Our whole school Christingle Service in St John's church made a perfect ending to our term. It was an absolute pleasure to spend the afternoon in Cedar Class listening to their presentations on areas of African life and talking to them about the displays they had made. The children had researched many different aspects of Africa - wild life, geography, culture and lots more. They knew such a lot.... and I found out that lemurs have two tongues! Children from Elm, Beech and Rowan classes have enthralled families and friends this week with their production of 'Whoops a Daisy Angel'. Mrs Lewis brought baby Harry into school to meet us all today... there was a queue for cuddles! Children from Willow and Cedar class have enjoyed getting really muddy today whilst learning the skills of Cyclo-Cross! It's always busy in our Early Years Elm class ... and today was no exception! It is taking a very long time to carefully glue sheets and sheets of A4 paper together and then turn them into the longest Christmas letter ever! Meanwhile other children have been busy indoors and outside. 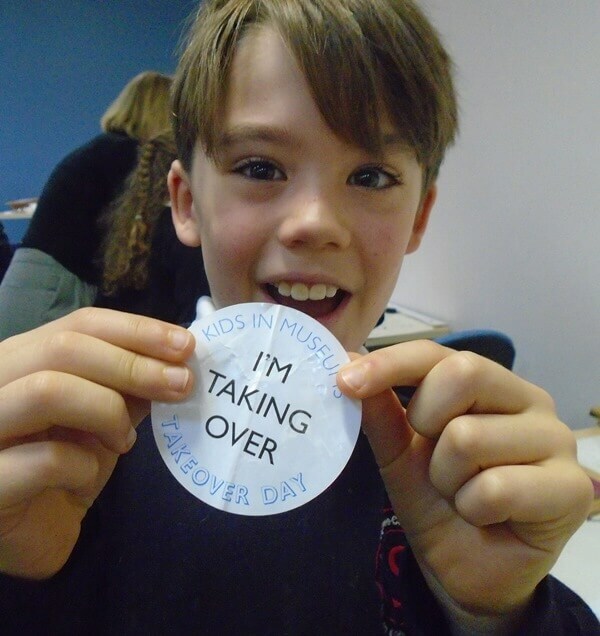 Children from Cedar Class spent this morning 'Taking Over' the Taunton Heritage Centre. They answered phones, met members of the public and answered questions and helped put up new information displays. These were the words that inspired our visitor, Evan Mawarire, from Zimbabwe who visited us today and talked with children from Cedar and Willow class to tell his amazing story. Evan talked clearly and simply to our children, explaining how he felt he could no longer sit and do nothing about the 'bad things' he saw happening around him under the rule of Robert Mugabe. He was arrested twice and his wife and three daughters fled to a safe place in another country. Staff and children helped fund raise for this very special cause today by wearing their pyjamas to school - we all had great fun admiring each other's fashion style! Year 6 has been hosting our final Inspire session of this term. The focus of the morning has been to support our oldest children in working alongside their parent in developing their independent research skills. They have been challenged to research life in the trenches during World War 1 and then to present the information in a way that reflects their individual learning styles - a diary format, quiz, annotated diagram etc. Friday 9th November - there was an African theme to Cedar Class's Inspire Morning. Children were joined by parents and carers to learn about Adinkra symbols used traditionally in Ghana on fabrics and pots. Although the symbols have a decorative function they are also used to convey messages. Together, children and adults planned their designs and then made their printing blocks with patterns which would tell a story about the individual child or family. Thursday 8th November - Oak class community join together in a science workshop focused on World War 1 to making trench periscopes. 'I just thought it was fantastic! You all work so hard and I really saw your passion. We feel really grateful to be at this school'. These were some of the comments from parents who joined their children this afternoon. This afternoon children from Rowan class invited parents and carers to share in their learning and join them for a Victorian school lesson. Miss Darrie made everyone warm up with physical exercise routines before setting challenges to make Victorian spinners and peg dolls. 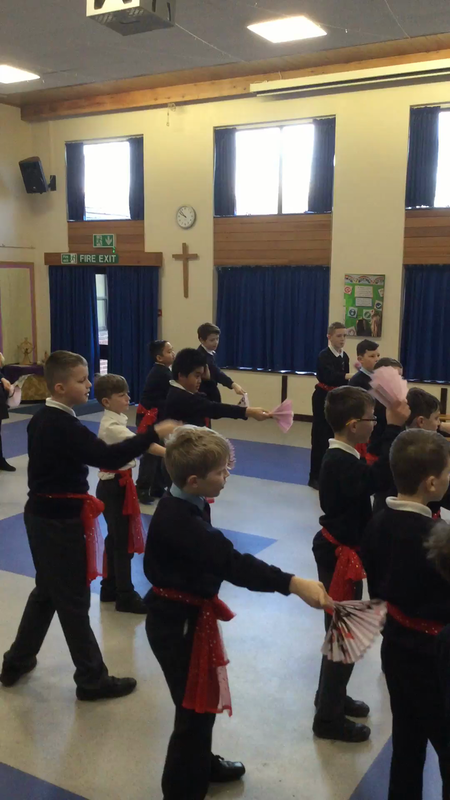 The children then led a demonstration of ballroom dancing. This morning parents and carers joined children in Cherry class for a morning of Stone Age arts and crafts. Our focus on 'Reading across the curriculum' was supported by instructional texts. Activities included making stone age shelters, models of stone age axes and grinding rocks and soil to make paint for cave paintings. On Monday children welcomed their parents and carers to join them for an art lesson on pointillism. Waiting for the time to come. Horses trotting over the trench, soldiers riding. Bombs rattling the earth like dice. I know many parents have already taken their children to see the display of boards commemorating the end of World War 1 at the cathedral in Wells. Each board represents the work of one of the schools from our Bath and Wells Multi Academy Trust. If you have not had an opportunity to visit yet there is still plenty of time as the display will be there until 22nd November. The steps up to the beautiful chapter house looks stunning with a river of red poppies flowing down the stair case. Wednesday 24th October - our Poppy board has been delivered! This morning I took our beautiful Poppy Board over to Wells Cathedral to join a number of other boards from MAT schools that had already arrived there. We took the board into the cathedral and up into the Chapter house. Eventually every arch will be filled by a board and a river of knitted and crocheted poppies will cascade down the spiral staircase. Tuesday 23rd October - our first sharing assembly for parents! 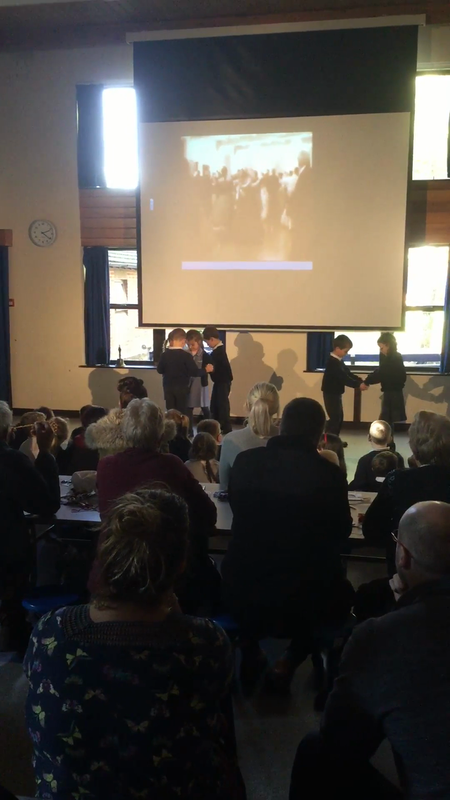 Children in Cherry Class became trailblazers as we introduced out first sharing assembly to celebrate the amazing learning across the curriculum that takes places every single day at Staplegrove school. The sharing assemblies are to become a regular feature involving every class throughout the year. 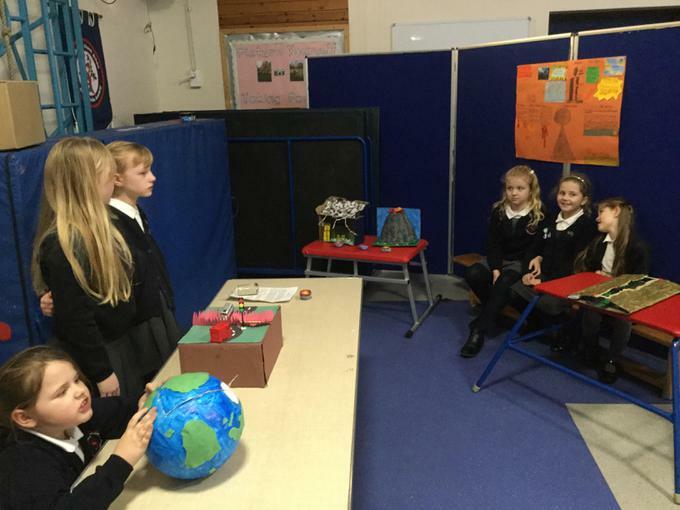 Family and friends were all invited and lots turned up to listen to Cherry class children talk about fossils, show observational drawings and models, read poetry and play music that they had composed. We were SO proud of them all. Last Saturday, St John’s Church ran a coffee morning to help us raise funds for our stained glass window project. Members of the church were assisted by Year 6 students from Willow Class and the event raised over £200! As always, our children were a credit to Staplegrove and ran competitions, sold produce and books to members of the public. The event was a great success and we look forward to seeing the stain glass window in place. 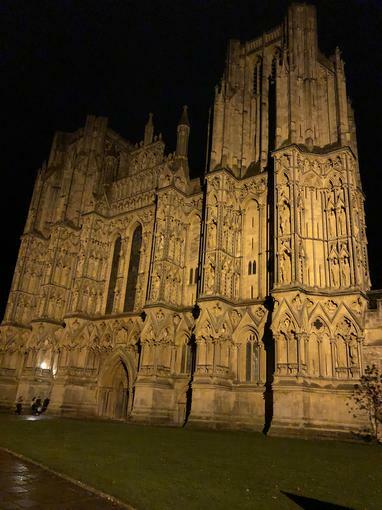 As part of the Bath and Wells Multi Academy Trust celebrations commemorating the centenary of the end of World War 1 there will be a special display in the Chapter House of Wells Cathedral. Our Trust schools have been asked to proved a display which reflects something unique to the school and the community. Each board has been cut to fit inside one of the arches in the Chapter House. Children in Rowan class have researched the names of the soldiers who had lived in Staplegrove and died in battle in World War 1. One of the children discovered that one of the soldiers have previously owned and lived in what is now their family home! 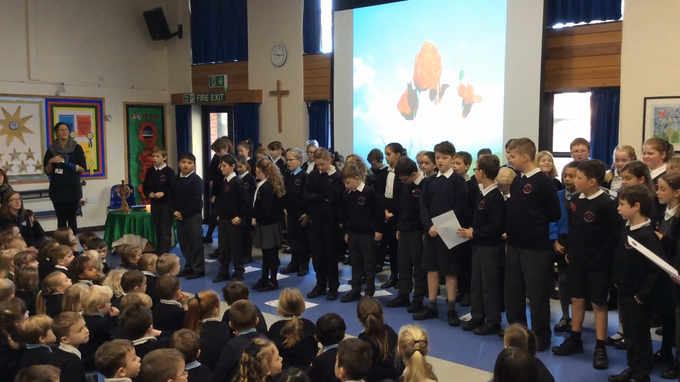 Our Staplegrove board shows the work of Rowan class, with the names of the soldiers and the memorial gate at St John's Church and a stream of poppies rising to the sky and transforming into doves of peace. Each child in Rowan class has made a poppy and each poppy is made in a different way. The display in Wells Cathedral will run from 29th October until 16th November, with children's activities over half term. The display is open to the public.. so please go along and see it. 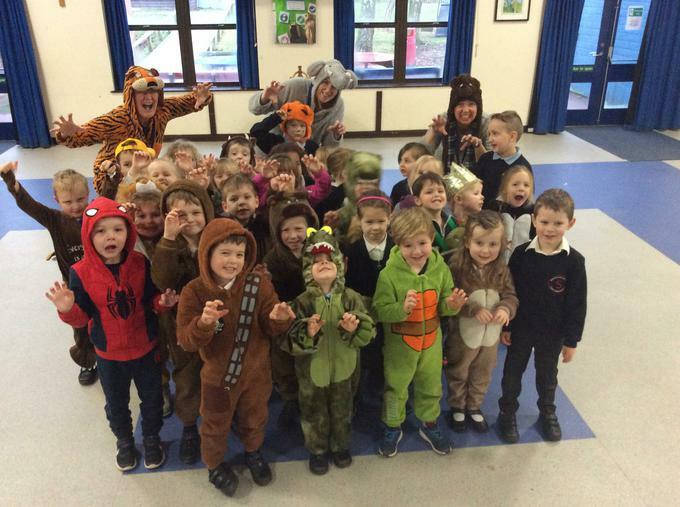 October had has had a very special start for the whole community of Staplegrove. Yesterday the Bishop of Bath and Wells visited the church for a service of dedication for the beautiful work that has been done in reordering the interior. This was followed by a celebration lunch. Today we held our Harvest Services in church, when children brought gifts of food to give to the 'Open Door' charity for the homeless in Taunton. Our children's Worship Team led the service and helped us all to think about those less fortunate than ourselves. The building company Modwen came to talk to us all about the dangers of playing on a building site. With lots of new houses being built around Staplegrove knowing how to stay safe is especially important. Honour the life size puppet joined us to help us think about staying safe. Twenty five very tired children and four staff have just returned from their residential on the Isle of Wight. During the course of this week they have visited Alum Bay and seen the famous 'Needles', Osborne House holiday retreat of Queen Victoria and Prince Albert and Carisbrooke Castle as well as taking part each morning in a range of outdoor activities including abseiling, quadbiking, survival skills, high ropes and lots lots more. 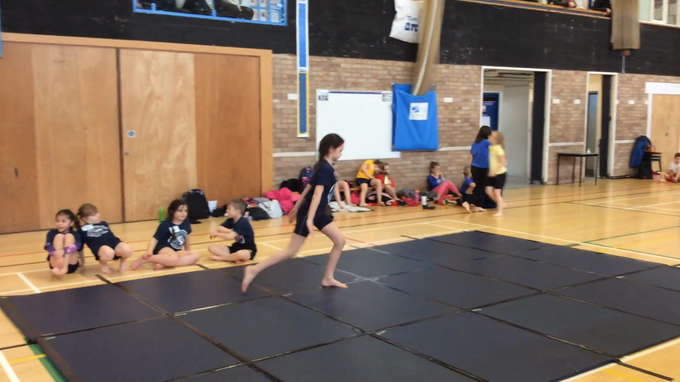 So many people commented on the children;s outstanding behaviour and their ability to work together as a team. It was a real pleasure to be with them all. Today Sariqa Wagley one of our parents came to work with us today. Sariqa is a research biologist at the University of Exeter and she led a STEM (Science,Technology, Engineering and maths) workshop for our children in Key Stage 2 on the subject of good and bad microbes. She also helped children to realise that scientists aren't just men - that girls can aspire to be scientists just as much as boys! It was early on Saturday that the excitement of the non prom evening finally gave way to sleep. Before that point the children had enjoyed a barbecue, games, film and music and the fun of being together before taking the next steps into secondary education. 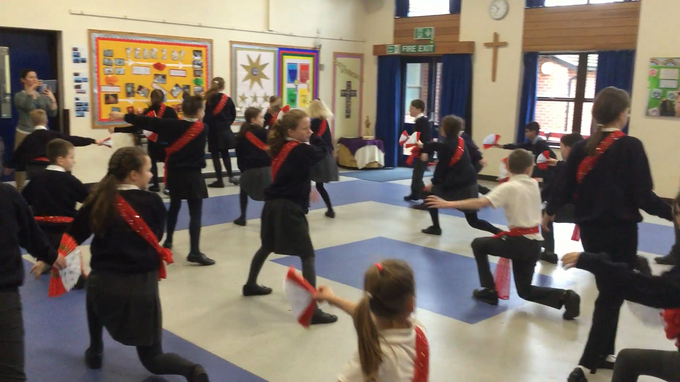 Year 6's performance of 'Vive la Revolution' today was a resounding success. The children had written the script based on the learning this term. They had also chosen the music and choreographed the dances. it was truly brilliant..... one parent said 'it was the best I've ever seem'. Well done Willow class we are very proud of you all. Monday 9th July - What a celebration! On Monday evening, between 6 pm and 7:30 pm we held a school celebration of all the learning that has taken place throughout the year. 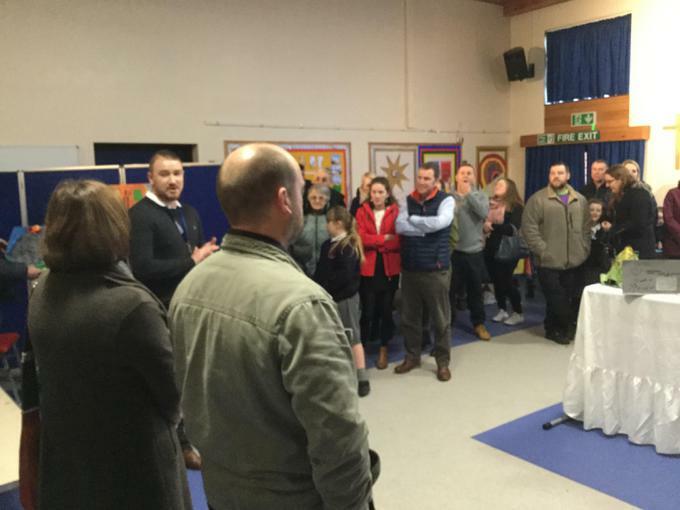 Parents, carers and friends came along to visit classrooms and see interactive demonstrations and displays of children's work. Every class gave a performance in the hall or in their classrooms. Children proudly talked about their learning and staff had taken great care and a lot of time to set up their classrooms. Cream teas were on sale and were enjoyed in our lovely grounds. Thanks to the generous donation from FOSS the whole school has been able to learn from and enjoy the planetarium. We all squeezed into the huge dome in the dark to learn about space missions and see planets and constellations projected onto the ceiling. The children LOVED it and learned so much! Staplegrove children have been amazinlgly busy at home and in the local community - making us all very proud of them all! Noah came 7th out of 12 in the age group of children in years 4-6 and beat a number of older children, including 2 from his club, who have been fencing for longer than him, and he learnt quite a lot whilst there. Ellie and her sister spent over 3 hours over 2 days at the weekend selling raffle tickets at her daddy's garden centre - she sold over 100 tickets! Ellie also made the promotional posters. 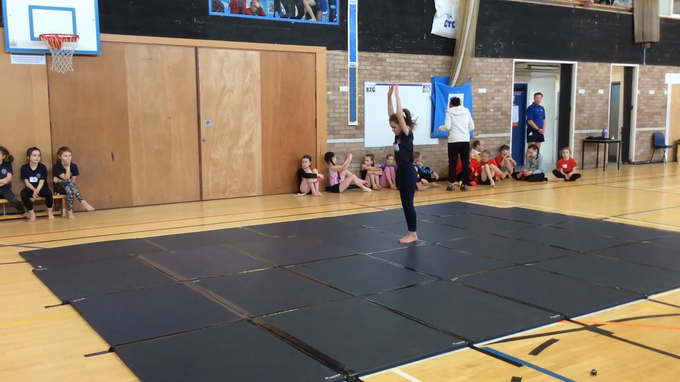 Well done to Ellie - it shows real enthusiasm and commitment to raising money for the school. A special 'well done' to Georgina who has decided that following up her learning in school with extra learning at home is fun! Georgina did some research on sunflowers and produced this amazing display board with nearly everything you need to know about sunflowers!! Some of the children from our school choir were fortunate enough to join with ten other schools from the Bath and Wells Multi Academy Trust and take part in the annual 'Together in Voice' celebration in Wells Cathedral. The massed choir was inspirational, singing their hearts out to a variety of songs that reflected the journey of life. The children were joined by the Bridgwater Salvation Army band. It was a wonderful evening in a beautiful cathedral, packed with parents and supporters. Children from Oak Class visited an exhibition of knitted bible figures today. The beautiful, knitted characters were set out in scenes to illustrate bible stories. Children were able to talk with members of the local community of Rowbarton Methodist Churchand make new friends. The knitting project involved members of the congregation from St George's Church in Hartlepool. 'What a lovely time we had this morning. Mr. Tucker and his class were a joy to welcome. I personally enjoyed every minute I had chatting to the children about the stories. You can be very proud of your Year 4s'. Friday 15th June - Our Book Week this year is lasting slightly longer than a week so we can fit in all the planned activities! Our focus is on the author, Michael Morpurgo, to coincide with a special exhibition at The Museum of Somerset. All of Key Stage 2 have either already visited, or are about to visit, this exhibition. Year 3 and 4 have participated in a half-day session with Years 5 and 6 participating in a creative writing workshop lasting a full day. There was no charge for these activities. The younger children have been visited today by Eddie the Explorer. Elm, Beech and Rowan classes have each had a session with him learning about one of Morpurgo's books. Thank you to FOSS for paying for this activity. Back by popular demand, is our Book Character Parade when the children come to school dressed as their favourite book character. Book Character Day will be on Friday of next week. So many families came along to join our lunchtime picnic - it was a very special time together. Tuesday 12th June - PERFECT weather for a Sports Day. This morning parent of children from Key Stage 2 joined us for our first session. The day was opened by Elm and Rowan classes who entertained us with their brilliant maypole dancing. .. and then it was time for the races! We were really privileged today to have a visit from David Hill, a 2 times Paralympian in Swimming and Triathlon, World and European Medallist and British Champion. In 2004 David was GB Team's youngest Athlete to compete in the games, where he competed in the 100m backstroke.In 2013 he began competing in para-triathlon events and went to Rio 2016 as part of the GB squad. David was born with no left forearm but told us that he was brought up to believe that nothing would be impossible. His message to us was 'Don't say 'I can't', keep trying to be the best you can be'. David's shared his inspirational story from his first ever swimming badge, all the way through to his Paralympic success. Staplegrove children were buzzing with questions, including 'How do you manage to ride a bike with only one hand?'. Davis showed them how he fixed on a special arm glove and gripping attachment. Children from Elm and Rowan Classes were taking advantage of the sunshine today and polishing up their Maypole dancing ready to open our Sports Day next week. We returned from our spring half term to discover that the long awaited work had started on our playground make over - it's going to look amazing! Coloured rubber mulch is being laid to make dedicated spaces for children to have exciting play opportunities and also places to sit quietly and reflect. Work is still in progress - but here are a few before and after photos. KS2 children received an exciting invitation this week to attend the official opening ceremony of the new skate facility at Hudson Way Park. The children not only got to meet the Mayor of Taunton, Her Worship the Mayor Cllr Catherine Herbert, but were also treated to a skating demonstration. Local resident Richard Parker, winner of five European Championship titles and silver medallist at the X-Games in China and his brother Robert took to the ramps and wowed us with their skating skills! Children from Cherry and Oak Classes made the journey across the Severn Bridge to the Caerleon Roman Fortress and Baths. The Roman remains are some of the best in the UK and during a day packed full of new learning the children built up a vivid picture of life in second-century Roman Britain... and had a lot of fun in the process! As part of their English curriculum Cedar class walked to Taunton Museum to consider the differences between myths and legends. They listened to the story of the 'Gurt Worm of Shervage Forest' and found out about the Norton Dragon. Using some of the museum artefacts the children wrote their own legends and produced some beautiful art work based on the dragons eye and Hunky Punky gargoyles. Evan was chosen to open a very special box containing a burning hot egg.... the question was... What was inside the egg? And what had laid this egg? Evan had to wear special gloves to stop the egg from burning his hands. This week many of Year 5 children have been taking part in a Bikeablity Course and have been practising on the local roads around the school. Pauline Dodds, our Diocesan Advisor, led teaching staff in a training session on our new RE framework' Understanding Christianity'. We were joined by one of our Governors and member of St John's Church, Iona Young. One of the challenges was for teachers to sequence a number of very abstract pictures, that told the 'Big Story' of Christianity. This process led to some interesting discussions - but the proud team below showed they could do it!..... even after a long day at school!!! Friday 27th April - Well done!! 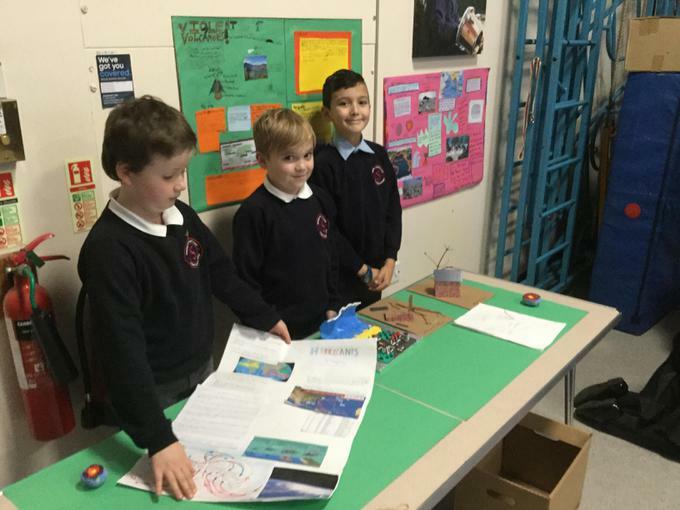 On Friday 27th April, the school’s Science Ambassadors took an exciting trip on the train to Weston-Super-Mare in order to compete in the Big Bang @ Weston science competition. Their challenge was to design and make a lunchbox using recycled materials, considering issues such as food miles, healthy diet and sustainability. 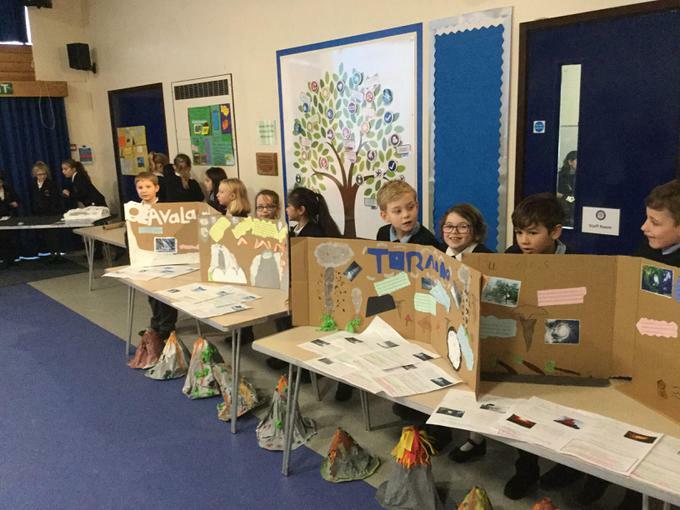 The children then had to present their designs to a panel of judges. The children worked hard on their entries at an after-school club and we are delighted that they were the chosen winners, bringing home a state-of-the art microscope as their trophy. The Science Ambassadors being awarded their prize by the Mayor of Weston. 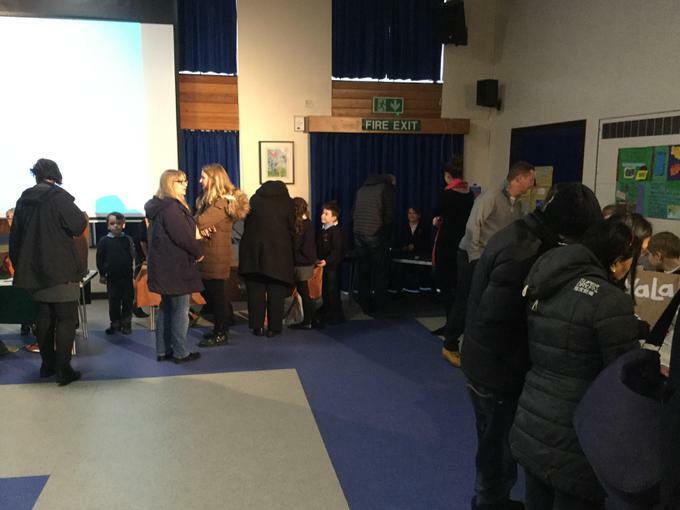 Our Maths evening for parents was a fantastic success - over 70 of our Key Stage 1 families came along to find out more about how Maths is taught at Staplegrove School. We talked about how to support children at home and there are now new resources available in the Invent Gallery. 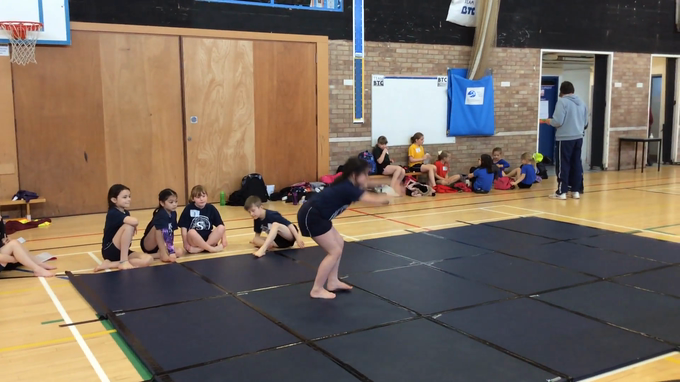 We plan to run a similar event for KS2 in the very near future. Welcome to the start of the Summer term. Oak and Cherry classes have been launching their topic on the Romans today by welcoming a Roman soldier into school who told them a lot about his daily life. However, I think the Roman soldier was amazed by the amount that the children already knew!! It was just wonderful to see children with their families coming into school,this morning holding flowers to decorate our Easter Cross. Our Year 6 House Captains carried the cross at the head of our procession to church. The church was packed with children and families as we joined together to hear the Easter story retold by our Worship Group and House Captains .... and then it was back to school for a hot cross bun feast!! In a special whole school gathering this morning we said 'thank you to Mrs Sweet, who has been a teaching assistant and has also run Grovers over many years. We presented her with a number of different gifts including a rose bush for her new garden, some chocolates and some wine. Thursday 22nd March - Millie, Sam and Grace from Cedar class represented our school at a Circus Skills workshop at St James Church School. The event brought a number of schools from across our Multi Academy Trust together to learn and practise a number of skills. The session was led by Dodger's Circus and the children had great fun trying juggling, plate spinning diabolo, ribbon waving, stilt walking, pedaloing and lots more! Millie, Grace and Sam began the morning a little nervously but ended the sessions with huge smiles and having made lots of new friends! Monday 19th March .... and another snowy day! Children in Beech and Rowan class have had great fun putting their maths skills into action in a snowy context. Their first task was to collect 100 (ml) millilitres of snow in a container. Containers have been placed at various locations around the school - indoors and outdoors to see which pot of snow melted first - and to predicted whether the melted snow would give them more than 100ml, less than 100 ml ... or the same.. Joshua was convinced that light might help it melt quickly so his is by the window! The next challenge ..... was to build a snow man exactly 8 cubes tall. This was a lot trickier than we thought! ....... but eventually Charlotte did it!!! And then it was inside... for a glass of warm squash! Next week we will be saying a special 'thank you' to Mrs Sweet , who will be leaving us after 12 years working as a member of staff and more years as a parent. Mrs Sweet was a teaching assistant up until December last year and has since continued to run Grovers. We wish her well with her house move and we will be making a special whole presentation to her next week. Can you imagine the surprise for the children in Beech and Rowan classes when they went into the school hall and found a tent pitch and an explorer asleep inside?!! To their amazement the explorer turned out to be none other than 'Ernest Shackleton'! Mr Shackleton told them a lot about his life as an explorer and his travels..... and then, exhausted, he went back inside his tent for a sleep, whilst the children went back to their classrooms to talk about all that they had learnt! Thank you so much to all the parents, staff and children who turned up yesterday to help clear the snow from our school site. Your help was greatly appreciated. Unfortunately, snow has melted into the roof space of our leadership office, which in turn has run through onto our desks, computers etc! So the leadership office is currently closed until further notice. ... and with Willow Class. The workshops have been inspirational. Amelia said 'I found it a joyful experience and I'd love to do it again'. 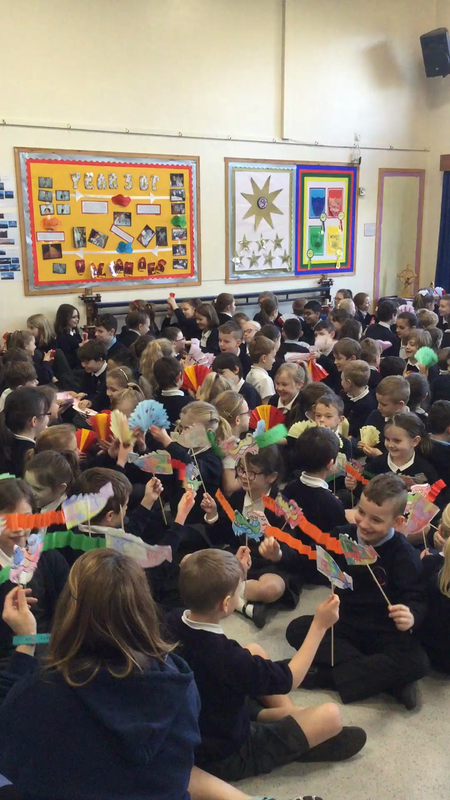 Our Chinese New Year workshops got off to an exciting start with a whole school assembly based around the fans that the children had made. Year 2 told me that they had an amazing time in their workshop. They learned a lot about different dance moves and how to move slowly and powerfully to the music. 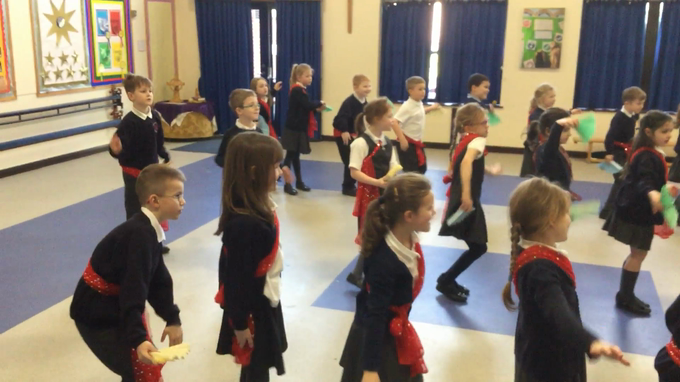 Cedar Class children took part in their workshop session with great enthusiasm. 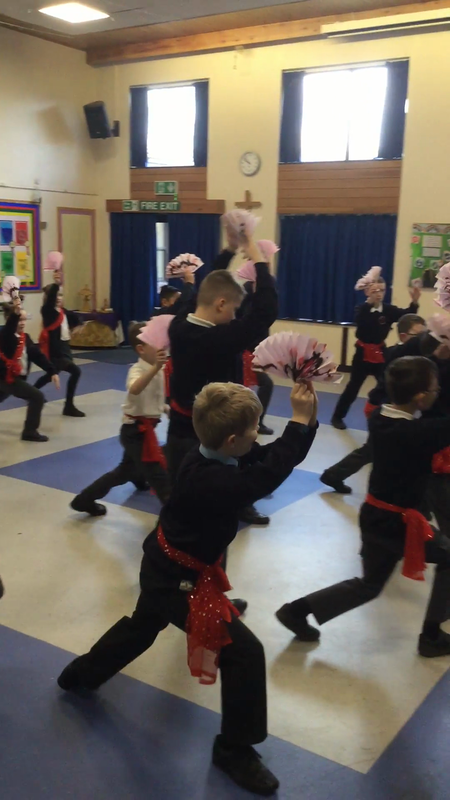 We are all looking forward to celebrating Chinese New Year through two days of dance workshops, on Wednesday and Thursday, led by professional dancer and director Kay Crook. You can find out more about Kay's work, both nationally and internationally, by clicking on the web link above. We are very grateful to the Friends of Staplegrove School (FOSS) for funding these two days. .... in readiness for our dance workshops. Friday 9th February - Rocking and Rolling!!! It was the children's turn to be dressed as Rock Stars today and, wow!, it was amazing!!! To the delight of admiring staff and children baby Ivy, Mr Tucker's new baby, paid us all a visit. Ivy weighs 7lbs 1oz and is now almost 2 weeks old. Ivy seemed totally relaxed about being in school. Miss Kirk really enjoyed the chance to give Ivy a cuddle. Today is Safer Internet Day and our children have been taking part in a series of workshops aimed at helping them stay safe. What does Your Selfie say? The video clip showed that an innocent selfie gave away a lot more information than the photographer realised!! For example, an update to the Snapchat Terms of Service indicates that Snapchat has the rights to reproduce, modify and republish your photos and save those photos to Snapchat’s servers. They discovered that if someone copies their photo and embeds it in another website they may not be able to delete it. Later today our support staff and teachers will receive training in teaching Internet Safety. There are lots more resources on the NSPCC website, on the azoomee link below and on the UK Safer Internet Centre website. Children in Willow and Cedar classes have been writing scary suspense stories and today, in candlelit and torch-lit rooms, they read them to parents and grandparents. The quality of their writing was outstanding and we all enjoyed waiting for the twist in the ending!! Mr Tucker's baby, Ivy, is now at home and Mr Tucker sent us some more pictures to enjoy. Welcome to Petrina Brereton who has joined our staff team as Office Manager. Petrina has two children who attend Staplegrove school, so already knows a little about the school from a parent's perspective. Congratulations to Mr Tucker and his partner on the birth of their baby girl, Ivy. Ivy arrived on Friday at 20:01 and weighed in at 6lbs 11oz. Mr Tucker said it was the happiest day of life and that Ivy was the most beautiful thing that they had ever seen! Mum and baby are doing well. Today children in Oak and Cherry classes held a 'museum' afternoon for their parents. 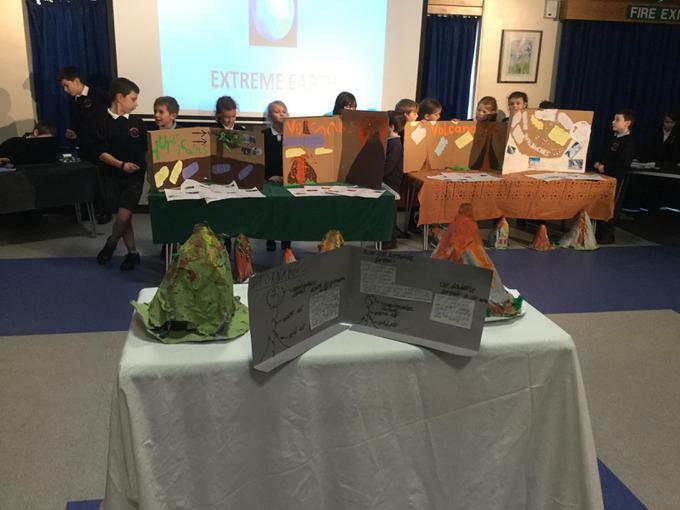 They set up displays of the work they have done over recent weeks on the theme of 'Extreme Earth'. The hall was packed with parents who had come to find out more. 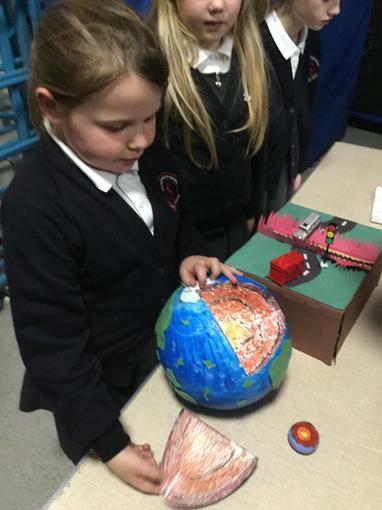 Children talked confidently about the geology, geography and science of volcanic eruptions and earthquakes and illustrated this with the models and displays that they had produced. We were all so impressed with their knowledge, understanding and confidence .... well done!! Ms Darrie and baby Esme popped in to see us all today. It was really lovely to see them. Cherry class were especially excited to meet Esme. 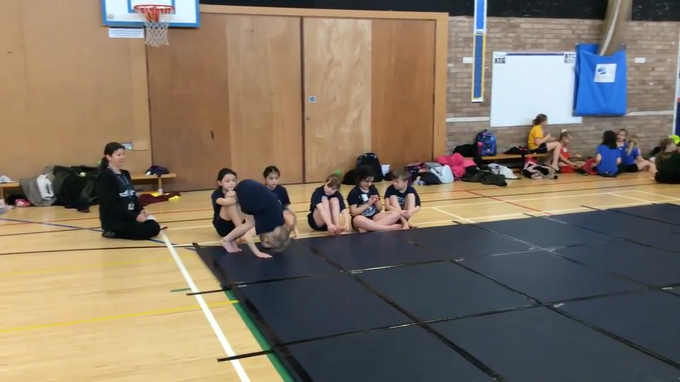 Our Year 5 children from Cedar class joined with other pupils from across Taunton to take part in lots of different activities aimed at developing different aspects of leadership skills. Blind ball was a particular favourite, when they played an invasion game blindfolded, using a ball with bell inside. Concentration and listening was critical to success. So far they have raised £267 (£318.75 with gift aid) from family, friends, local residents and parents and they will be delivering a fourth car load of bedding (sleeping bags, duvets and blankets) up to 'Open Door' this weekend. They were lucky to be given a full tour of Open Door to understand how they work and help people and were amazed and humbled by the great work they do. They offer a warm meal, shelter during the day, a hot shower and facility to wash their clothes, access to the internet to find work/homes, and of course a friendly ear to talk to. It is worth noting that they are also always in need of adult clothing, including underwear, coats, hats, warm shoes etc, as well as toiletries, loo roll, cleaning products and of course food donations. Noah and Maggie have been leaflet dropping in the local area and have been warmed by the kindness of strangers, and also the generous donations of parents, friends and family. They will still continue to collect throughout the cold weather so if you would like to make a donation, no matter how small, please visit https://mydonate.bt.com/fundraisers/warmforwinter. You can also donate any unwanted bedding by bringing it in to school and leaving in the outdoor classroom and notifying reception. After fastening their seatbelts, Beech and Rowan classes "jetted" off to Kenya for the day. They then exchanged the plane for minibuses to go on a "virtual safari". After that they split into groups to complete four different activities. 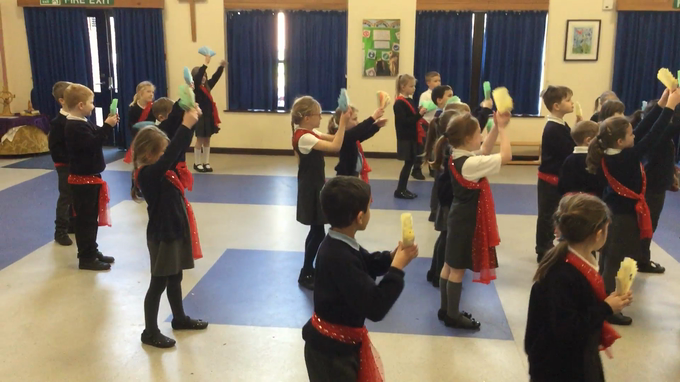 They made a Swahili dictionary and learned how to sing "Heads, shoulders, knees and toes' in Swahili as well as learning how to dance in a traditional African way. Next they carved animals out of soap to create their own version of a Kenyan soapstone sculpture. After that they cooked some traditional Kenyan foods: Ugali and fried bananas. The fried bananas sprinkled with sugar and nutmeg were very popular! Finally they played some African games including "Shisimba" (similar to noughts and crosses) as well as Jenga which takes its name from the Swahili word for "build". Friday 12th January - Staplegrove Rocks ..... Part 2! Tuesday 9th January - STAPLEGROVE ROCKS! Today saw us relaunch the times table package, TT Rock Stars, in a really dramatic way!! TT Rock Stars gives children a carefully sequenced programme of daily times tables practice and with success comes the opportunity to win coins and buy wigs/instruments/ and accessories for your rock star avatar. So, as children and parents arrived in the playground this morning they were surprised to see their teachers and support staff dressed as rock stars. One parent commented 'This has really lifted a dull, grey morning.It's brilliant!' 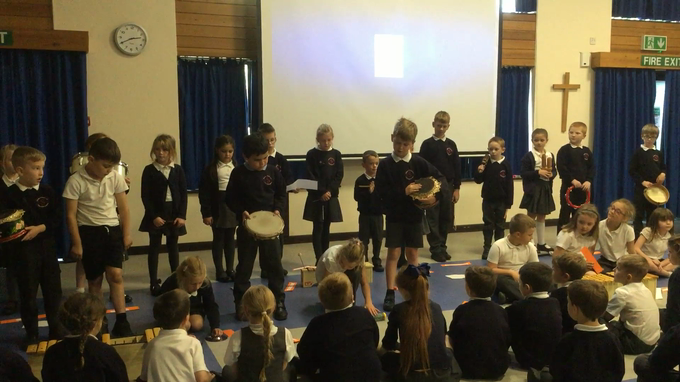 We followed this up with a special rock assembly and challenged each class to come with their own rock tables song to share with the rest of the school on Friday afternoon. In our worship this morning we looked at a picture of the night sky - full of stars. We talked about this time in the church's year called Epiphany when we remember the Three Wise Men following the star to Bethlehem. 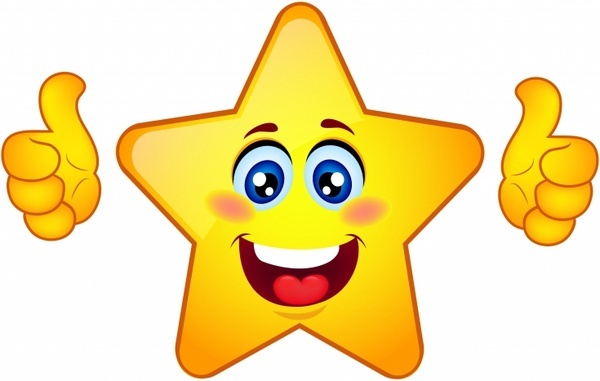 We thought a lot about what it means when someone says ' You're a star'... and how we can all be a star. As we look ahead into a new term and a new year we wondered what we can shine at. A special welcome to Mrs Donna Brewer who is joining our office team for two days a week to lead on finance. Rev Kivett led us in our worship and brought along what is possibly the biggest Christingle in the world!!! 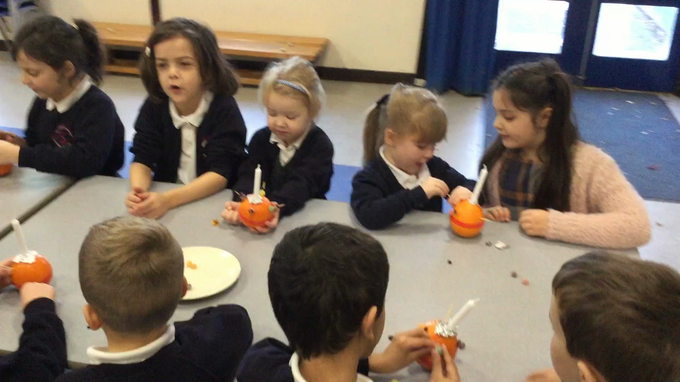 Thursday 20th December - Christingle Making! Everyone is busy making their Christingles today ready for our Christingle Service this afternoon which will be led by the Rev Kivett. Wednesday 20th December .... Father Christmas calls in ! I really enjoyed going to St John's Church this morning to watch their Nativity play. Particular highlights were the scooter camels and the dashing Santa!!! Well done to everyone at Stepping Stones who supported - it was brilliant. I thought you might also like a look at the inside of the refurbished St John's - it looks amazing! Monday 18th December - It is the turn of Cherry and Rowan Classes to present their performance of Christmas around the World. 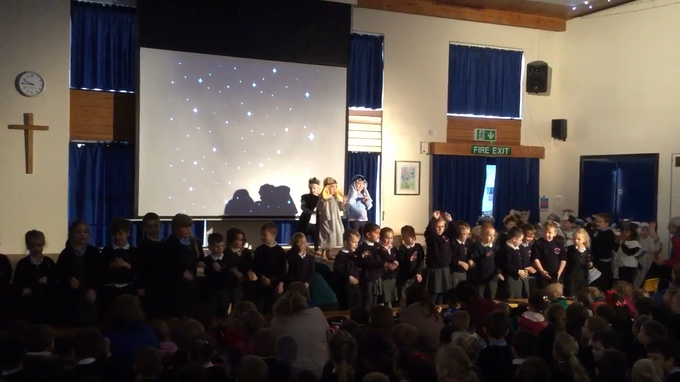 Despite having 15 of the 60 children off sick today they did an amazingly professional job at covering the absences and we all really enjoyed the acting, singing and dancing. We had hoped to have our Carol Service in the church. However, St John's has been closed since June and despite plans to reopen in time for this event some last minute ' snagging' meant that the architect could not authorise the opening until the following week. So the KS2 team decided to make use of the outdoor classroom and spent hours decorating it with festive lights. It looked lovely and many parents commented on how good it was to see the outdoor classroom being used in this way. Unfortunately, the damp weather affected the sound system after a while and so staff decided that, rather than disappoint the children, we would all move inside. 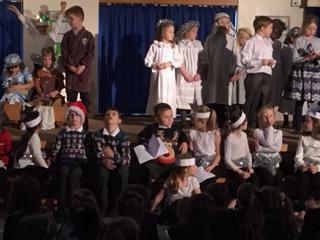 Just to say to all concerned how much we enjoyed the Christmas celebrations at the school yesterday evening. There was a delightful, relaxed atmosphere - both outside and indoors! - and the children were amazing. We very proud to be there and see children involved in the joy of the occasion. Warm wishes to all staff for a relaxing break and, of course, a Merry Christmas. Ms Darrie and baby Esme had hoped to pop in a see everyone and wish them a happy Christmas - but with the mix of germs that seem to be in school she felt it was better to leave Esme's first visit until the New Year. 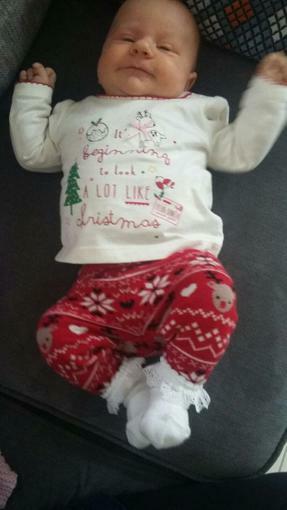 However, she sent this recent photo of Esme.... who is clearly ready for Christmas !! 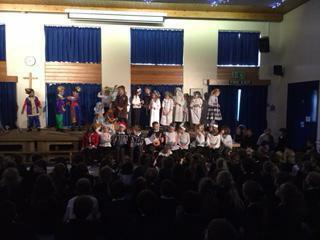 Tuesday 12th December - Rehearsals for this afternoon's Nativity Play are well underway! Thursday 7th December - What a performance! 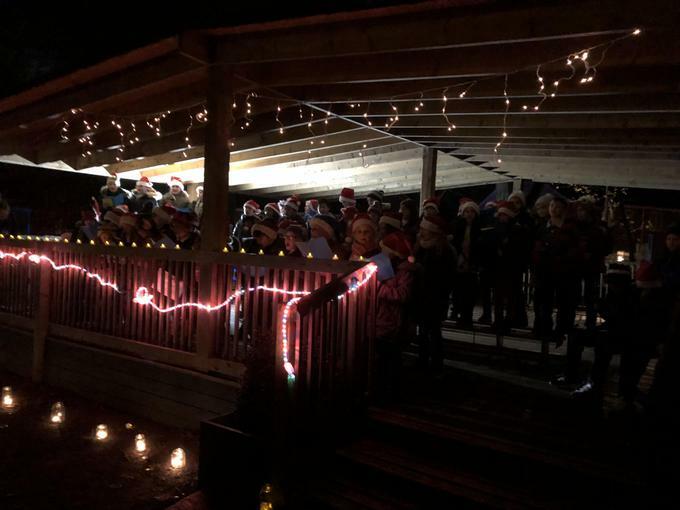 It was a late night for our school choir as they joined other schools across Somerset to take part in the 'Let's Celebrate' Carol Concert. The beautiful setting of Wells Cathedral made it even more spectacular and special. After the lunchtime rehearsal the children had a well deserved break and watched Paddington 2 at the Wells cinema and then it was back to the cathedral for the final performance.... and a celebratory 'hats in the air ' at the end of a wonderful evening! I am delighted to attach a special letter sent to all the children of Staplegrove School by our SIAMS (Statutory Inspection of Anglican and Methodist Schools) Inspector, who visited us last week. We are unable to publish the outcome of the inspection until the final report is received, probably just before Christmas. However, what I can say is that it all went very well indeed. 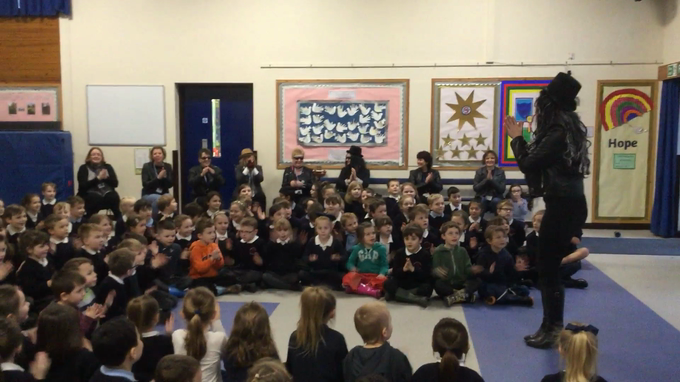 The inspector, Mr Steve Ford, looked at work in books, talked to a large number of children and visited classrooms. He also met with staff, parents and governors. However, the children were the stars of the day and we were all so proud of them. The attached letter of thanks to the children, that I read to them all today, reflects the way they shone out on the day and as always. I hope that you enjoy reading it too. Wednesday 29th November - A 'Take Over' ! You may be forgiven for thinking that you’d called the wrong number when getting in touch with Somerset Heritage Centre recently. 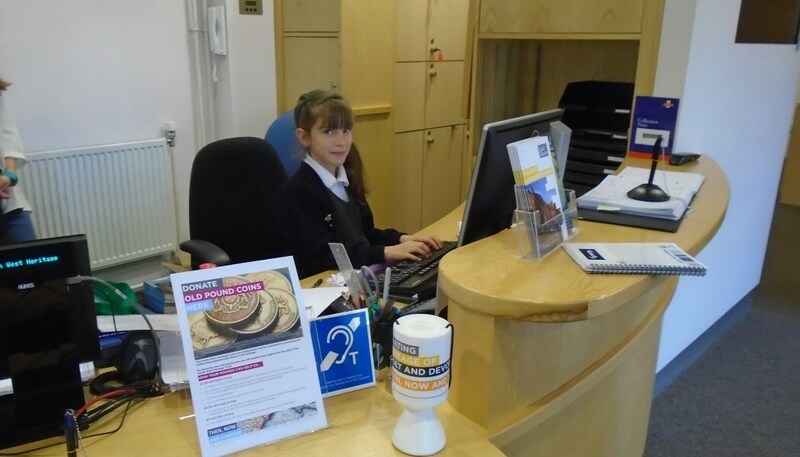 As part of South West Heritage Trust's 'Takeover Day' pupils from our school were manning the phones as well as taking on other important museum roles. Some children took on jobs as receptionists, others became journalists, some worked in the store rooms, whilst others worked on museum statistics for September and October. At the end of this week we will be saying a special 'thank you to Mrs Giles, TA in Willow class, as she leaves us to follow a career change into the health sector. Mrs Giles has been at the school since September 2012. We all wish her happiness and success in her new venture. Thursday 23 November - And it's systems go for Operation Christmas Child !! We have been busy packing shoe boxes with small toys to go to children across the world who are less fortunate than ourselves. There was great excitement as children arrived in school in spotty clothes and carrying piles of 1ps and 2ps for our line of coins. We collected four boxes full of coins .... so we are still in the process of counting!! Where ever I go around the school there are so many stunning displays to enjoy, all celebrating children's work and the values that we stand for as a school. Recently we have been thinking a lot about Peace, through our Worship and in class. Every child has made their own poppy and some of them are displayed in the beautiful poppy cascade in the hall. Others are in classroom displays. Year 5 have painted poppy stones and are going to leave them in places around the local area to help people think about peace. Today Naftali Madela Onchere came into school to tell us about his village in Kenya. 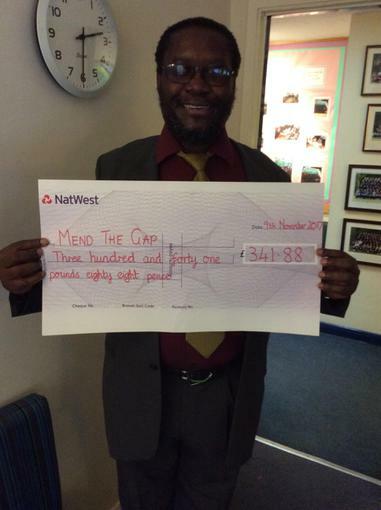 We presented him with a cheque for £341.88 which we had raised across Staplegrove and Norton Schools. Naftali told us that it can be very cold in Kenya and asked the children if they could start collecting warm jumper for the children in his village.